Mr. Snarky has taken the kids to the park, with the idea that I use this alone time to do something I want to do. I finished the book I mentioned on Friday (Constellation Games , which I loved as much at the end as I did when I was halfway through on Friday night), and I don't feel like starting another book right away or reading about starting my own company (I'm roughly 3/4 of the way through Escape From Cubicle Nation: From Corporate Prisoner to Thriving Entrepreneur ). So I thought I'd write a blog post. Pumpkin being a "whale watcher." The ears announce that it was her birthday, and garnered her much attention and joy. 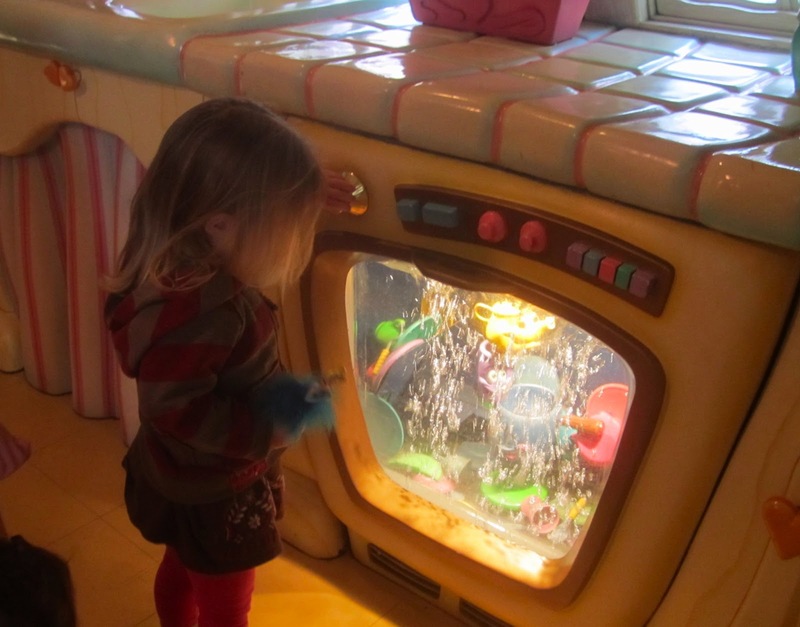 Petunia loved the kitchen in Minnie Mouse's house. She considers meeting Mickey and Minnie highlights of the trip. Instead, I'll tell you about something I realized during that trip. The low point of the trip was when Petunia got sick. We don't know if we let her overheat, or if her stomach was upset by her unorthodox decision to eat leftover mac-and-cheese for breakfast, or what. But she was clearly not well Friday afternoon, so I took her back to the hotel to rest in some air-conditioning. I thought she was better and went back out that evening to meet up with Mr. Snarky and Pumpkin for dinner. I won't say that doing so was a mistake- I got a couple of great margaritas, Petunia got a stuffed baby Mickey Mouse that she adores and we did see the fireworks. But Petunia threw up between dinner and the fireworks- which is why I know that the adorable stuffed baby Mickey Mouse is 100% washable. Anyway, when we got back to the hotel that afternoon, Petunia just wanted me to hold her. I was sad and grumpy. I felt like we'd let Petunia down by letting her get sick, and I was sad to be missing out on Pumpkin's afternoon- Pumpkin was LOVING Disneyland, and it was really fun to see that. Too bad, though, this situation was what I had, and no amount of feeling sorry for myself was going to fix that. I figured I should make the best of it, and give Petunia what she wanted. I was at that point reading Zero History , which I have in paper form, so I was not able to read until Petunia calmed down enough to let me put her down on the sofa. Instead, I just looked at Petunia. I was struck by watching her as she snuggled into me. Her eyes half-closed and I could see all the stress and unhappiness just leave her body. She snuggled in, put one thumb in her mouth, ran the other hand under my shirt- as she likes to do- and smiled. And I realized, I am her refuge. When she is stressed or hurt or worried, she wants me, because snuggling into me makes it better. This is both a benefit and a responsibility of motherhood*, I think. I have written before about what was lost and what was gained when I became a mother. To me, this trumps them all. The feeling I get when I can comfort my child just by being there and holding her is literally indescribable. I won't try to describe it, but I will say it is amazing. It is, without a doubt, something I experience as a benefit of motherhood. It is also a responsibility, though. My children's physical need for me will decrease as they get older- already, Pumpkin wants these comfort hugs less than she used to. But I don't think the effect goes away. I remember reading about a study that found that kids' stress levels go down when they talk to their mother on the phone. I know that talking to my mom on the phone always makes me feel better, and I'm 40 years old. This is an average effect, though- there are some people for whom their mother does nothing but add stress. I think we are hard-wired to want that initial caregiver bond, and to want that bond to be with someone who can be a refuge. What a horrible thing it must be when that person is instead another source of trouble. I hope I will always be a refuge for my children, in whatever way they need. I will admit that I'm looking forward to the point at which Petunia no longer needs to stick her hand under my shirt for comfort, though! *Or more precisely, of being the caregiver a child has bonded with as comfort person- it doesn't have to be the mother, and I think even when it is the mother, other caregivers can have a similar, if perhaps a little less powerful, effect. But I don't want to get into all of that in this post. Can we please just take it as a given that I am not trying to denigrate anyone else or their parenting experience, but am writing about a benefit and responsibility I feel from motherhood? DC2 has had a somewhat fussy day. It will be sad when the magic breasts (as DH calls them when handing off a fussy baby) no longer work as pacifiers. But by that point kisses will make most things better. With both my kids, the magic calming effect of physical contact worked long past the end of nursing- and we stop nursing lateish (~2 years). With Pumpkin, it was touching my hair. Petunia likes to touch my skin. I am 30 and still get refuge from my parents - just today I had a great heart to heart with my dad, something I don't do often enough. Makes me sad for my partner who's mother mostly exasperates him & would not be described as a refuge. Also, I have never experienced Disney and to me, seems like the last place on earth I would ever want to go. But your description of your kiddos joy melts my icy cold heart (just a tiny bit). Yes- it is sad to think about people who don't get this sort of refuge. It is such a source of strength for me, the idea that my parents will always be there for me, supporting me. 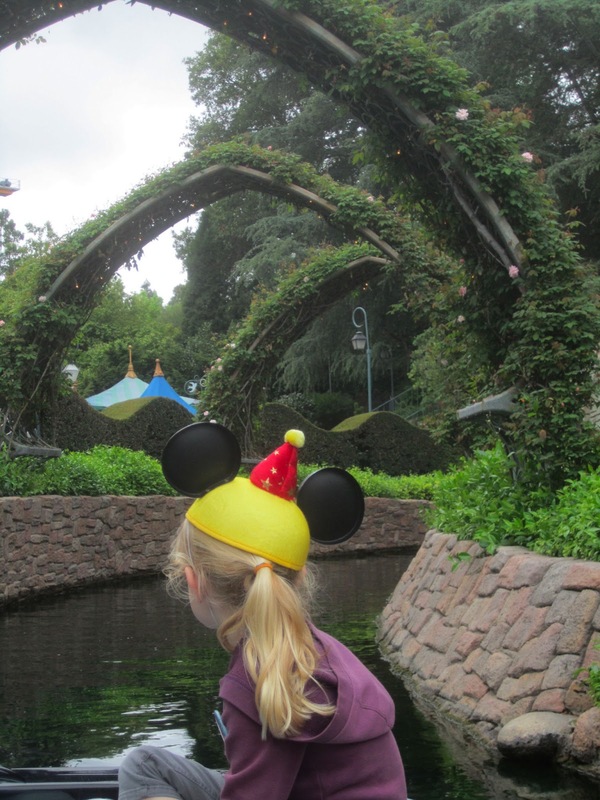 I know that there are people who enjoy going to Disneyland without kids. I am not one of them! To me, the magic of the place is watching the joy it brings the kids. But then, I'm not a big rides person, so the rides themselves hold little appeal. So very true...one of my favorite things about motherhood. Evan has always used my hair as a security blanket, and now he's old enough to ask for "mommy hair". The immediate calm, and (for lack of a better description) how blissed out he looks brings a smile and a sense of pride every time. I remember when i was younger (even into my teenage years) I'd get a physical yearning for a hug from my mom. Even now, talking to her in times of stress/sadness/etc. always helps. Ah, yes. Pumpkin was a hair kid, too. Drove me nuts sometimes... but I have a picture of her and me in Hawaii, when she's about 20 months old. She'd fallen or something, and was crying, and I had picked her up. She wrapped her hands in her hair and leaned her head on my shoulder and was better. Mr. Snarky snapped a picture. It is one of my favorites. Baguette does this, too; although she has a purple plaid blanket and a series of stuffed animals that often travel with her, it's clear that her real lovey is my hair. Oh man, that reminds me of when I was trying not to deliver the baby in the car with DC1 (we left a little late, and not pushing when it's time to push hurts) and my mom petted my head. It helped! And I've noticed I do the same thing to my babies. I went on a work trip by myself for the first time since the kids were born. I've gone on short work trips, but this time I was gone for almost 3 weeks. My eldest child (4) was a mess while I was gone; he finally sat down and cried about how much he missed me. I am his refuge. I love being his refuge. He curls up in my lap and relaxes; it's like he just melts. He was talking the other day about wanting to go back into my belly so we could cuddle all day long. But it's wrenching to be away from him, not because I miss him so much, but because I know how upset it makes him. Oh, I know what you mean! It is so hard for me to even ignore Petunia crying for me when it is Daddy's turn to give bath or something. She doesn't do it all the time, and he's really good at breaking her out of it... but still, it tears at my heart. Sweet post Cloud. I feel that sense of refuge every night now with my little guy when we read books before bed. A few months ago, I had put my arm around him when we read books before bed. (Before that we just snuggled closely). He snuggled in extra close. Every night since then, if I (or his dad) forget to put our arm around him at book time he grabs our arm to put around him and says 'Mommy/Papa, put your shoulder around me'. :) I love it every time. Awwww. Petunia says she wants to "touch." She says "I touch you, mommy." And it is so sweet, even if sometimes I just want some space! Sooo sweet, Cloud. I know exactly what you mean. I cuddle every night with my 5-year old after her bedtime story; we just lie in her bed together for a little bit before I say goodnight. The other day she asked if I can keep doing this with her until she's a teenager! And my 8-year old still likes to cuddle too. She's had a cold sore this week, and I think that may be why she's particularly cuddly now. My parents were not big into physical affection when I was growing up (it's a cultural thing), and I remember that and keep it in mind so as to remmeber to hug my own kids. Yes, I'm still their refuge, and that wordless contact and comfort are better than words! The cuddles are so sweet. I know I'll miss them when they go away! Petunia is a particularly snuggly little kid, too. I have to say, I never co-slept with my kids when they were babies. they didn't like, and didn't sleep well. But now i love to sleep with them, and i often do. Sometimes when their dad is away, I'll sleep with one and then the other (waking up in the middle of the night to switch beds). Waking up the younger one is the best, because he's super loving and cuddly in the morning. He'll hold me close, and then just start kissing me, all over my face, very gently and sweetly. I'm tearing up a bit as I read this, because I am this person for my son (or one of them -- but I am the main one) and because my grandmother, who was that person for me, is no longer here for me to call on the phone. This really speaks to me. My DS (Pumpkin's age) has recently started asking me to snuggle him at bed time -- basically to snuggle him to sleep. This is odd, in that it's not a habit we've had since he was tiny, and of course utterly sweet and delightful, except that often by his bedtime I am just ready to have some time to myself. But. Really, how long will he want snuggle time? And lying beside him relaxing as he falls asleep is in fact (mostly!) quite delightful. If he turns it into a chatter opportunity (i.e. is evading falling asleep and/or going to take forever to fall asleep), I excuse myself (thankfully, he is -- touch wood -- familiar with the idea that there is stuff I need to get done before my bedtime and that I am going out to the other part of the house but he needs to stay in bed), but if he really does want a snuggle, well, it's a delight. I was just out of town for 5 days (a rarity, but not unheard of and not something that usually causes any excitement), and he had 1-2 meltdowns per day in my absence and some even after I got back. I think he's at a developmental stage where this was hard for him, poor guy. Me too! My son, also the same age, has recently been asking me to snuggle him to sleep, and mostly it's really nice. I also excuse myself if it's clearly not working, and sometimes he'll say "it's OK mum, you can go", other times he'll look me in the eye and say so sweetly "I really want to snuggle" so we snuggle. What I love about these recent snuggle sessions is that unlike when he was a baby, now he falls asleep really easily, doesn't squirm/mumble/hold his breath, and he is just so happy that I'm there, often saying "mum, I love snuggling with you sooo much". Wonderful post - you're even making Disneyland seem palatable to me! Yes, refuge is the right word for it. I looove to cuddle my kids, too. It makes me feel better. Our favorite place to cuddle is on the couch for Family Movie Night. Oh goodness. This made me choke up big-time because after 7+ years of being my mom's PT caretaker/provider, I didn't realize how much I still needed her until she was gone and I couldn't hug her anymore. She was my you to your Petunia when I was sad, and there was nothing that made me sadder than losing her. It's just that I had forgotten that over the years of taking care of her. May Pumpkin and Petunia have you to snuggle for eons to come. Yes, refuge is the right word for it. I love to cuddle my kids, too. It makes me feel better. Our favorite place to cuddle is on the couch for Family Movie Night.